I am unable to make up my mind about Rushdie: is he a genius or is he mad? The borderline between the two is very thin. As this genius crossed from sheer brilliance to inexplicable eccentricities, I am left bewildered and don’t know in which category to place him. However, I make it a point to read anything he writes. He is not easy to read. Every time Taki of The Spectator mentions his name he prefaces it with the words "that unreadable Rushdie". Taki’s judgement is highly biased because there is lot Rushdie has written that is highly readable and a lot that is difficult to comprehend and leaves the reader with the uneasy feeling of being illiterate. His latest novel Fury (Jonathan Cape) is a mixture of the readable and the incomprehensible. It reminded me of a kind of patakha we used to play with on Divali. You rubbed it against a hard surface and it spluttered into tiny explosions as it hopped about in different directions. Without exception the book was rubbished by English and American critics. There is a strong element of anti-Americanism in it. Fury is evidently autobiographic, Rushdie style. The main character is a chap called Solanka. He is Mumbai-born, has a doctorate from King’s College (Cambridge), the same as Rushdie. He ditches his first wife and son and escapes to New York (so did Rushdie). He makes a killing inventing new kinds of dolls (in Rushdie’s case books). He has affairs with different women till he runs into the love of his life, Neela Mahendra, a Fiji-born Indian. Neela is Padma in real life who he steals from his closest friend, a Black American. There is a lot of violence, including some murders and much boozing. Neela is upset by the coup d’etat in Fiji and flies home to be in it. Solanka chases her and lands himself in a prison cell before he is let off. I am not sure whether Neela and he live happily ever afterwards but apparently Rushdie and Padma are enjoying themselves in the Big Apple. The dog-days of summer end with the monsoon. The month of September is singularly without character, neither warm enough to switch on the AC nor cool enough to switch off the fan. And largely flowerless. With October life picks up:exhibitions, dance recitals, concerts, literary gatherings. The marriage season is in full swing. Being a man whose life revolves round books, I look forward to new publications, readings by authors and book launches. A book I am looking forward to most this coming October is the first novel in English on Nepal by a Nepalese girl. There are good reasons for my looking forward to this event. For one I have never been to Nepal and know next to nothing about this Himalayan kingdom except that it is Hindu. I am baffled by the news that is published in the papers: the royal family, the Ranas, its common folk and the communist movement. The massacre of the royal family stunned me to disbelief. I am still not sure about the motives for the patricide, matricide, fratricide and homicide. To be quite honest, all I know about Nepal is that whatever happens there, they point the accusing finger at us Indians, their closest neighbours and like them largely Hindu. And that Manisha Koirala is Nepalese. More important than all these considerations is that I happen to know the author, Manjushree Thapa. She is the ravishingly beautiful daughter of His Excellency, the Nepal’s Ambassador in Delhi. 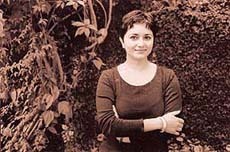 Manjushree was a Fulbright scholar who did a course on literature and creative writing in the University of Washington (Seattle) and on photography in the Rhode Island School of Design. Back home in Kathmandu, she has been writing literary columns for Nepalese Times and translating Nepalese fiction and poetry into English. The Tutor of History (Penguin) is her first novel in English to be published outside her country. It will be released in Kathmandu early October and later the same month in Delhi. It is about the love affair between a Nepalese girl and her history teacher. A family living in Haryana has made growing ber (zizyphus) more profitable than growing apples, oranges or mangoes. The members of this family grow the best bers I’ve ever tasted. I wrote about them some years ago. They dropped in to see me earlier this year and brought me samples of a new product they are marketing, gulukand. I had vague notions of what it was: some kind of mash of rose petals and sugar said to be good for the stomach and prescribed by both Ayurvedic and Yunani systems of medicine. I tried it out first thing in the morning with a few teaspoonsful of chilled milk. It was as fragrant as it was delicious to taste. I am not sure if it did my stomach any good but I look forward to beginning my day with it. I wrote to my friends to send me more through VPP or let me know if they had an outlet in Delhi. I did not get any response. I asked Kishan Lal of Rajdoot Hotel if he knew a good brand of this rose concoction. He got me a plastic jar of a well-known firm producing Ayurvedic medicines. It had a different fragrance and taste. I turned to my newly-acquired friend, astrologer Dimpy Chopra. "No problem" she replied. "I’ll make some for you myself." And so she did. It was yet another kind of fragrance and taste. Instead of sugar she had used honey. Finally I asked my friend Dr Vinod Verma who has written a lot of books in German and English on Ayurveda and Yoga, including a bestseller Kama Sutra for Women. "Why didn’t you tell me earlier?" she reprimanded. "Imake it all the time for my family in Ludhiana.When I return fromGermany three months from now I will make some for you." However, one morning she breezed in unannounced with a plastic jar of fresh gulukand that she had made herself. "I have to catch a flight to Frankfurt. See you in December," she said as she waved me goodbye. So I have four kinds of gulukand made of different kinds of rose petals. Most manufacturers simply buy them or collect offerings made to temples; that is why their products are not very good. Would readers knowledgeable about the subject enlighten me how this delicious concoction is prepared, and if anything besides rose petals, sugar or honey should be mixed in it.And if it is any good for the stomach, blood, heart or whatever. On a visit to the USA, Gorbachev met a Russian who had immigrated to this country. "What do you do for a living here?" the Soviet leader asked him. "My brother, my sister and I work in a big factory." "How do these capitalist bosses treat you?" "Just fine," answered the man. "In fact, if you are walking home from work, the boss picks you up in his big car and drives you to your door. Another time, he treats you to dinner in an expensive restaurant. Sometimes he takes you home for the weekend and buys you presents." Gorbachev was stunned, "How often does this happen?" "Well, to me, actually never. But to my sister, several times." Note: Khushwant Singh is away on holiday, there will be no column next week.